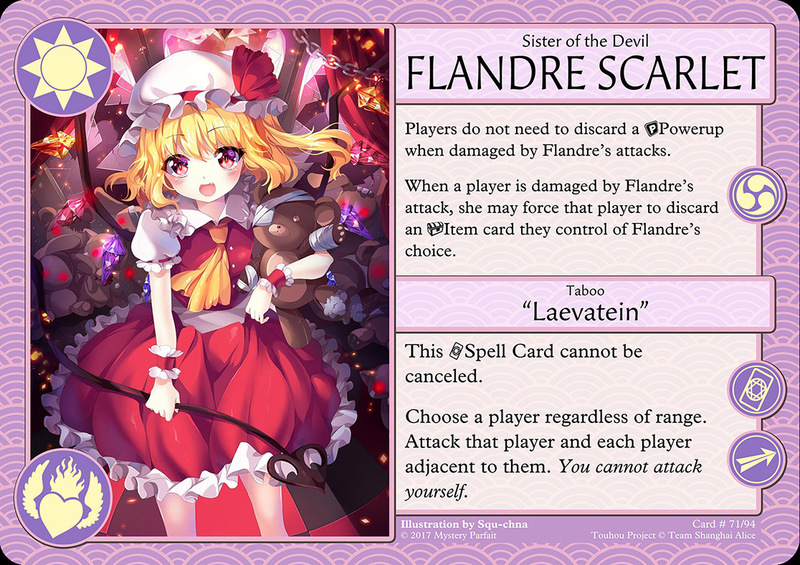 Flandre Scarlet was illustrated by SquChan, who told me she really likes mayhem characters. True to form, Flandre likes to play rough. Her Ability lets her choose any item to destroy when she hits another player, overriding the usual Power Up loss and the defensive Abilities of characters like Alice, Futo, and Shou. Her Spell Card, Taboo “Lävatein”, hits 3 characters in an arc, enabling her to do mass destruction but also possibly hitting an ally. 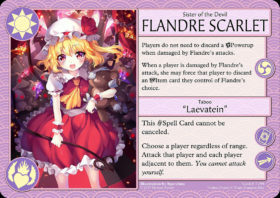 Flandre really is best as an Extra Boss. ← Psychexplosion! Sumireko topdecks into Danmaku! !